Click here for the preview that actually gives you some ideas about how this game's going to be played. Read on for the one with pretty graphs and hand waving. Format is the same as last time, so you can skip the next paragraph unless you need a refresher. (And for reference, here is the original post that kind of explains what I'm doing). After the break, for both teams I've included a graph that charts the offensive and defensive ratings for each game of the season. Keep in mind that for the defensive rating, lower is better. For both offense and defense, I've included a trendline showing roughly how each unit has progressed over the year. The dotted line shows the national average efficiency. I've also included the average ratings for their last ten games, to give a snapshot of how the team is playing right now. To give these numbers some context, I show where this would rank in the full-season stats, and what team's full-season rating is the closest. OK, so you already knew Texas had a good offense. But did you know their defense has been playing a little better recently? Now, "better" is relative - it's not like they've all of a sudden turned into last year's team. But prior to Wednesday, they'd held 5 straight opponents to an eFG% under 50, and forced 5 straight to turn the ball over at an 18% rate (their first and second such streaks this season, respectively). I expect the second streak to continue. Whether the first does will probably determine whether this is a close game or an easy win for Kansas. Scraping out a narrow victory in Norman on senior night against a strong defensive OU team hasn't altered the graph much. The offense is still trending upwards, though not as strongly as before, and the defense is still trending down at the same rate. Take KU's worst offensive game in their last 11, pair it with their worst defensive game in the last 6, and they still should be expected to beat Texas, though it would be close. One slightly worrisome fact for KU fans is that the team's offensive performance is significantly correlated to their defensive performance, specifically opponent eFG% and OR% (see the bottom of this page). No other KU opponent this year has ranked as high in both eFG% and OR% as Texas. So not only might the Texas offense be a tough test for the Kansas defense, it might also be a tough test for the Kansas offense. Just a note - the comparison of the offense to Georgetown (for both these teams) is a bit misleading. Sure, they're playing at a level equivalent to GTown's season stats, but the Hoyas are playing even better than that recently. I'd like to get a database up and running that can automatically calculate last-10 ratings for all the teams. But I'd like a free burrito about now, too. As Jacob pointed out, this is a matchup of two of the hottest teams in the country. If both teams are at the top of their game, there will be 3 elite units on the floor - the exception being the Texas defense. 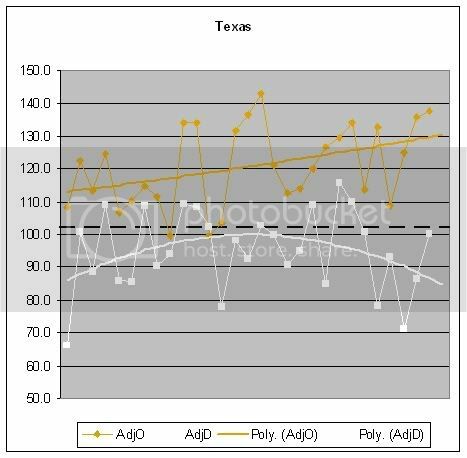 But if Texas can shoot and rebound well, the lack of transition opportunities will keep the Kansas offense from performing at it's best, and Texas will be able to stay in the game. I'm gonna say this ends up being Texas's "A" game vs. KU's "A-" game. That should be enough for the Hawks to pull out a single digit home win. Welcome visitors from Sports Illustrated. If you like what you see, please add Phog Blog to your favorites and tell your friends. I posted an efficiency laden preview of the Ohio St vs. Wisconsin game over at yocohoops. I'm going to do the same thing here for the KU-OU game, but with less explanation of the numbers, since you PB readers have had a couple posts to get used to them. For reference, here is the original post that explains what I'm doing. There's not going to be a lot of analysis, just numbers and graphs. Sorry about that, but I feel Hoopinion and Chalmersfan do a much better job of that than I do. After the break, for both teams I've included a graph that charts the offensive and defensive ratings for each game of the season. Keep in mind that for the defensive rating, lower is better. For both offense and defense, I've included a trendline showing roughly how each unit has progressed over the year. Also, the dotted line shows the national average efficiency. I've also included the average ratings for their last ten games, to give a snapshot of how the team is playing right now. To give these numbers some context, I show where this would rank in the full-season stats, and what team's full-season rating is the closest. 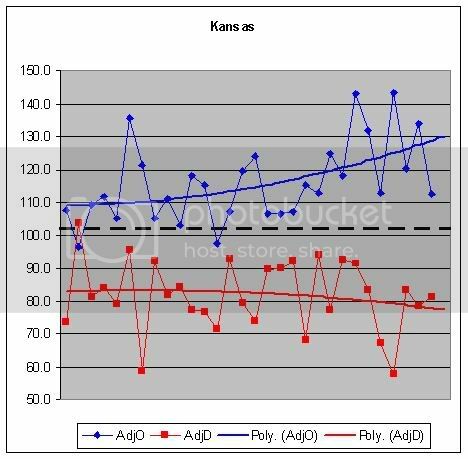 Obviously this graph looks really nice. Offense is trending upwards, and 4 of the best 5 games have come in the last 6 games. Defense is trending downwards, and 2 of the best 4 have come in the last 4. Really not much to say here that you wouldn't have figured out from using your eyes or traditional stats. The team has playing at a very high level against inferior competition. 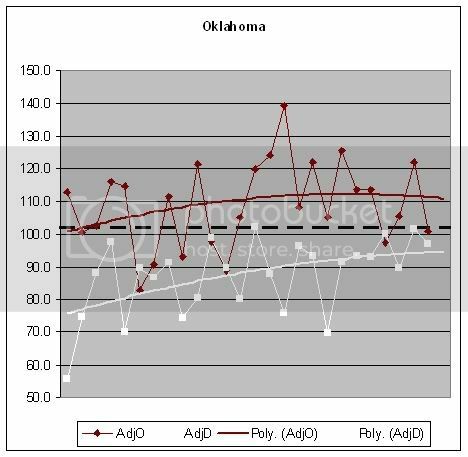 Pythag .8941 52 Kansas St.
Oklahoma's offense has improved over the season, but leveled off recently. Their bad games are around average, and their good games are 25% above average, instead of their bad games being 10% below average and their good games being 15% above average. Still some inconsistency. 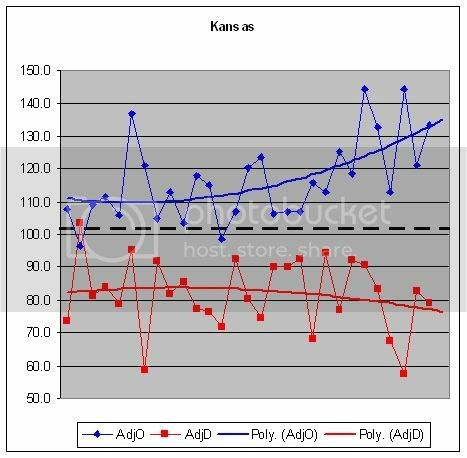 But the improvement in their offense is canceled out by their decline in defense. They haven't had a very good defensive game in their last seven. Their last 10 games, they've played like a top 50 team, but not won like a top 50 team, which has been the story all year. According to Pomeroy, they're the unluckiest team in the country. Still, they should at least be better competition than Iowa State. The efficiency data seems to suggest this won't be as close as all the power ratings and Vegas suggest, but I haven't been tracking these predictions for long, so who knows how accurate it will be. I'm going with a balance between the efficiency and power ratings, and saying it's a 12-point KU win. Mean: +15.4 ... Median: +15.8 ... right in line with Vegas. Ken Pomeroy's latest RPI projection has KU at 38th, which is important since we've now passed that mythical 40th parallel. We're up to 9th overall in his season-long ratings and nestled comfortably at 5th in his last 5 games rating (oddly enough, UNC is number 1 in that rating - good job Roy). By the way, KP's now predicting 13-3 in conference, with a lone loss at UT. Dunkel has us at 4th in the country in his latest index, behind Duke, UT and UConn (before last night's game). We're up to 19th overall and 6th in the pure points rating over at Jeff Sagarin's place (the pure points is more important to Vegas). Dolphin hasn't updated yet, but I'll try to remember to update that later. You might be interested to know that the composite of bracket projections has us at a #6 seed. Most of the latter day brackets have us as a #5, but some of the less frequently updated brackets have us as an #8 or #9, so we're averaged up a little. I think if we win out while losing impressively at UT, we have a very good shot at a #4. If we beat UT, I think a #2 is still *possible, but very very unlikely. A 4-6 is most likely at this point. I would almost prefer a #6 at this point to avoid a possible run-in with UConn, Duke or Villanova. Let's start with Pomeroy, whose statistical burgers are thick and plentiful. In his main Pomeroy ratings, we've moved from 14 to 13 after yesterday's win. We've held our position as the 4th best team in the country over the last five games, but oddly, the company ahead of us is different - we're now behind UConn, Georgetown and Oklahoma! We're also still 4th in the country in Pomeroy's Pythagorean rankings and his efficiency numbers behind only Texas, Duke and UConn. Sagarain hasn't updated yet either, but I don't expect a lot of movement, so we'll still likely be 7th in that (pure points) rating. Update, we've moved up to 6th. Dunkel hasn't updated either, so we're still 4th there. So this meaningless exercise has proved to be nearly Ecclesiastically meaningless, quite nearly a chasing after a wind which doesn't even end up being there. But that fact has never stopped me in the past, so you would be return-to-your-vomit foolish to expect that anything will change. The long and short is that KU is a top 15, and perhaps a top 10 team in the country, right now. Given our youth, we may crash into some wall - physical or emotional - and end this season in a blaze of disappointment. I don't think that's very likely though, because I'm not sure we're old enough to have learned about walls, physical or otherwise. I expect this team to win out the regular season with the lone exception of our game at Texas, which I believe will be a great one. Looking ahead, we will almost certainly be ranked for the first time this year when the polls come out tomorrow. #17/#18 Boston College Two wins on the road in the ACC this week should move them up a little. #18/#19 Iowa - Lost to Northwestern, and deserve to plummet for that, but they're leading the Big 10 and they knocked off Indiana in Bloomington, which should keep them from falling too much. #19/#17 Ohio State Couple of wins this week, including one at Ann Arbor. They will probably creep up, and deservedly so. #20/#20 OU They will probably stay where they are after two good wins this week, and I don't think voters will count the KU loss against them. #21/#23 Washington How on earth they stayed in the polls after losing three straight is beyond me, especially in the Pac-10, but two wins this week, including one over UCLA, should prevent them from falling out of the top 25. #22/#22 Michigan Michigan can say good bye to their ranking after losing three straight by a combined 51 points. They will go down, and they will go down hard. #23/#24 North Carolina For losing to Duke by 4, I don't think they'll get dropped. If they lose to Miami tonight, which is certainly possible, they will drop. #24/#21 Indiana Like their B10 counterpart Michigan, Indy will fall after having lost three straight. #25/#28 Northern Iowa A loss yesterday to Missouri State is plenty to drop them significantly. #33/#25 Colorado That Colorado stayed ranked after getting run out of the gym by Iowa State is an embarrasment to the Coach's poll. A loss to the Texas Aggies this week won't help their case. #26/#26 LSU LSU is a good team, but their loss yesterday to Florida will keep them out of the top 25. I think three teams will drop in each poll, leaving the door open for up and comers like KU, Bucknell, Cal and UAB in the cool kid's club. I think KU will be ranked as high as #19 and as low as #22 in the polls. A lot more pundits began noticing KU this week and the fact that we're 14-2 in our last 16 isn't being lost on most folks. Regular Phog Blog readers know that I try to follow the power ratings pretty closely, as they can often reveal things about teams that a straight up win-loss record does not. Here's how we stack in the various predictive ratings around the country. Pomeroy still has us at 14th, although we've moved up to 4th in his Last 5 games rating. In his efficiency and pythagorean ratings, we're 4th in the country, behind Texas, Duke and UConn, respectively. That's mighty nice company. Dolphin still has us at 5th in the nation, behind the above three and Villanova. Jeff Sagarin has us as 7th in his Pure Points rating, the predictions of which are always eerily similar to Vegas lines. And finally, the Dunkel index, which last week had us at 6th best team in the country, now has us as the 4th best team in the country (doesn't include Nebraska win). Last year, we had the best RPI in the nation, and yet we lagged in these predictive ratings. We all know what happened last year. This year, though our RPI has improved to 45 after last night's win, we're excelling at the ratings that the casinos use to predict games. My bet? Go with the casinos.